What do you get when you throw away an established series' playbook and try for something new? You get DK: Jungle Climber. 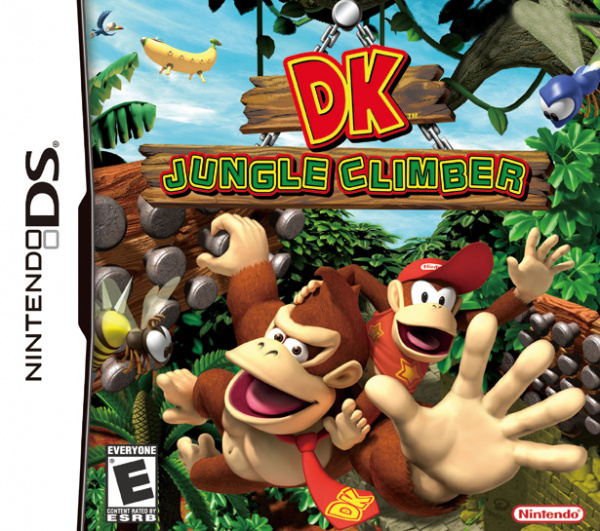 Unlike previous entries in the venerable Donkey Kong franchise, DK: Jungle Climber takes a fresh look at the series by focusing on swinging and timing more than precise platforming. The problem? It gets stale fast. The most unique — and interesting — thing about DK: Jungle Climber is its control scheme, which is lifted from its GBA-based sibling, DK: King of Swing. Standard movement is handled via the d-pad; everything else, however, is completely different. DK: Jungle Climber is set against an all-too-familiar narrative. King K. Rool has absconded with — what else?— crystal bananas. DK and crew set out to help their new comrade, a sentient alien banana named Xananab, recover the crystal bananas. Along the way they encounter an increasingly difficult series of challenges. Some levels are incredibly interesting, like one in particular which requires you to roll a large wheel made of pegs up a hill by keeping DK on its outer edges. Others, however, are much more straightforward affairs, simply requiring you to climb your way to the goal; by about stage four of the campaign's seven total stages you'll have seen it all. 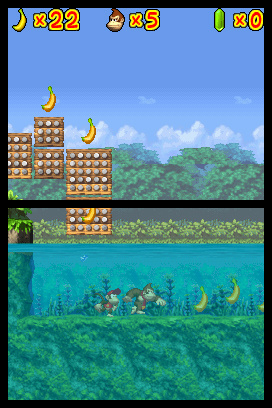 There are variations throughout, and at times Jungle Climber can still shine, but this is still a game from 2007, and in 2015 it feels like it'd be much more at home on a portable or smart device, most certainly not on Wii U. Level design isn't quite up to the standards Rare previously set up for the Donkey Kong Country series, but Paon did an excellent job crafting levels that feel familiar to longtime fans. Aside from the addition of pegs, many franchise staples are there - cannon barrels line most of the stages, and there are underwater worlds to explore as well. 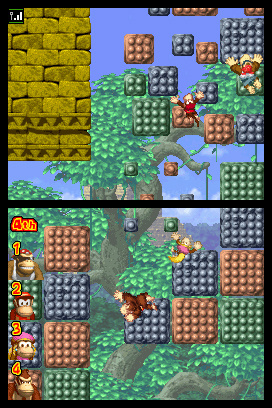 Visually, DK: Jungle Climber is familiar as well; it uses the same art style as Donkey Kong Country before it, a welcome departure from the 2D, hand-drawn feel of King of Swing. One area, however, in which Jungle Climber differs is its music. Donkey Kong games are fairly well known for their excellent soundtracks; it's impossible to mention the Donkey Kong series without Aquatic Ambiance or Stickerbrush Symphony coming to mind. David Wise did great work for the series in the past, and not having him involved with Jungle Climber leaves a void in this game. Even in spite of that, Jungle Climber's tracks are cheesy and generic; they sound like they'd be more at home in a third-rate '90s JRPG than a Donkey Kong title. But a DK title is more than just visuals and soundtrack. If these games carry a pedigree greater than their excellent music and cutting-edge visuals, it's their second-to-none platforming controls. Well, those aren't here, either. That's not to say what's here is bad, it's actually quite good, it's just very, very different from what longtime fans expect. Jumping is handled by pressing both the L and R buttons in unison, which sends Donkey Kong into kind of a floaty, sprawled-out leap with his back to the screen. 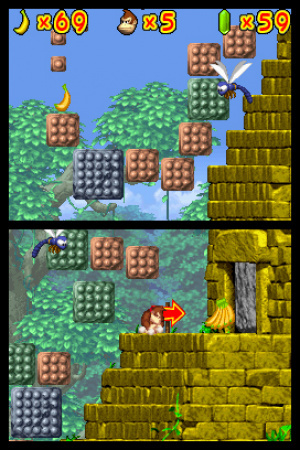 Unlike most Donkey Kong titles you have little control over DK's mid-air movement - there's a little leeway to move left and right, but nothing like what traditional DK fans will be used to. Instead, you'll be latching onto pegs littered throughout every level to keep DK's vertical momentum going. Once you've leapt into the air, the L and R buttons control the titular primate's left and right hands, respectively. If you grasp a peg with one hand, Donkey Kong will start to rotate towards the hand that's holding on. Of course, grabbing two pegs means you'll be planted in place, buying you some time to think about your next move. There are only two options once you're on a peg: jump or attack. Releasing the shoulder buttons will send DK flying, same as he would on the ground, and a quick tap of the A button will launch him into a flip, during which time he can kill enemies and destroy certain objects. Of course, this isn't the solution to everything, as there are a few power-ups worth mentioning. It just wouldn't be a Donkey Kong game without Diddy coming along for the ride; throughout the game the cap-wearing, peanut-popping chimp can be found in barrels, as usual. The difference this time, however, is that Diddy doesn't act as a swappable sidekick for our main character. Instead, Diddy himself feels like more of a power-up in that his main role is to be tossed in the air by DK to get to out of reach coins and collectibles. The other use for Diddy is powerups. Jungle Climber has three main power-ups: invincibility, which can be activated by tapping the DS ( or Wii U, in this case) touch screen, a hammer, or a flying contraption. The latter two are only usable if Diddy is with you, otherwise our favourite lumbering ape will walk right through them. DK: Jungle Climber is an interesting take on the tried-and-true DK formula, but one whose longevity gives way to a bit too much repetition. A poor soundtrack, combined with the Wii U virtual console's inability to play multiplayer DS games, leave you with little to do beyond playing through story mode, but none of this holds the title back from being enjoyable more often than not. When Jungle Climber released in 2007 it was a great portable title, but in 2015 it feels like it'd be more at home in your pocket than your living room. True DK fans will find something to love, but for the rest of you, you may want to really consider if this is the kind of game you'd like to spend your hard-earned money on. @Steve_Bowling and @NHoSang are the new reviewers, I take it? Welcome and best of luck to them both. Anyway, I could never find this one in stores, but I've always been curious about it. Seems like everyone ignored it when it came out because it wasn't DKCR, but that's obviously not a problem now! The final boss in this game was maddening, I could never beat it. @antipop621 You can use the cheat mode where you can use the crystal star power to easily beat him. I managed to beat him without it though. Its a great game but not as replayable as King of Swing. That game felt that there's lots to do. But its still a great game nonetheless. @ekreig Hi ekreig, indeed we are! Jungle Climber actually never popped up on my radar before I ran this review. I think it would've fared better with me back in '07, but it's still a fun distraction nonetheless. Though this isn't his finest hour. I imagine this is going to be the quality of game we'll see with this new mobile nintendo setup. The game was a fun DS game back in the day, but this one (and all GBA and DS titles) should be on 3DS. It's better not to compare it to Donkey Kong Country because the only thing which is similar is the visuals. I agree with this review, specially this part: When Jungle Climber released in 2007 it was a great portable title, but in 2015 it feels like it'd be more at home in your pocket than your living room. DS and GBA games should be on 3DS and not on Wii U! 6/10 sounds about right. I'm a huge fan of the DKC franchise, and this was quite the disappointment for me back in the day. Despite the faults listed in this review, I might actually enjoy this. I actually find non-traditional controls to be a plus. I wonder if I can find this at Gamestop or smaller trading store. I'm really REALLY glad Retro took the reins of the DK series because DCKR and DKCTF have been just about the best DK games since the SNES trilogy. Way better than this although I did enjoy it pretty well back in the day. @Henmii Same here. I thought the game had a few very memorable tracks, like the boss theme and the music from the factory levels... Or at least I think there were factory levels with really good music. It's been a while. I think this is one of the most underappreciated games ever. The gameplay is really unique and feels truly good to play. You use the shoulder buttons to kind of swing yourself, and its really a lot about having a nice "flow". Its a great game on the go that is simply put, simply a lot of fun. I personally would give this game an 8. Since this version is not on the go, I can kind of see why its not an 8. That shouldnt take away the fun that the story provides however. Would Nintendo Life ever end up reviewing these games again after already doing so once?